Customer Passion – Mutual Commitment to Customer Success: Ceva Animal Health committed to develop our customer’s knowledge and skills about controlling the diseases and farm management. 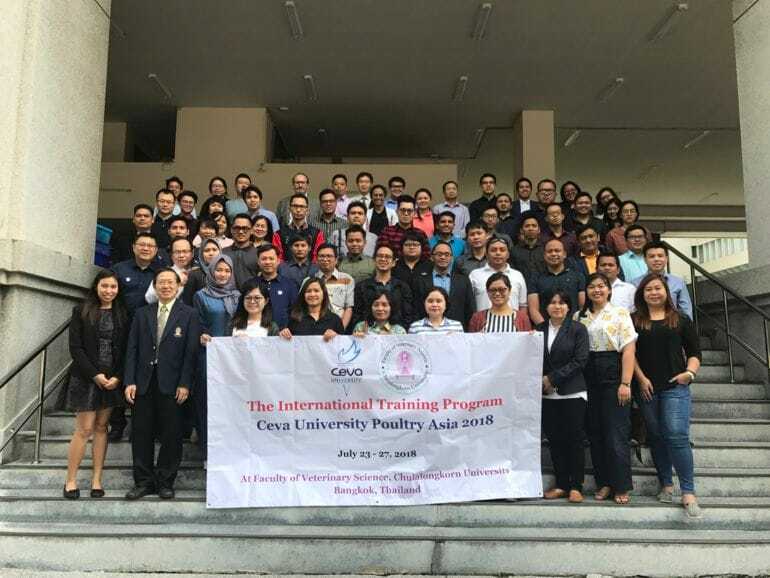 Ceva Asia had organized a poultry training course “Ceva University Poultry Asia 2018” in partnership with Faculty of Veterinary Science, Chulalongkorn University, Thailand on July 23rd to 27th at Chulalongkorn University in Bangkok, Thailand. This intensive 5-days training aimed at bringing together 60 poultry veterinarians or animal husbandries from Asian countries to mutually exchange their experiences about poultry diseases with internal and external lecturers (Professors from vet school in Asia). On top of that, farm practice such as ventilation, nutrition, biosecurity and management were on the training list as well. Those topics were highly supported by breeding company (Aviagen and H&N) and private consultant firm. Ceva University is now a well-established concept, organized by Ceva Asia annually. If you are interested, please feel free to contact Ceva team in your country for more details.